More likely, of course, is one of our vaunted, infamous, long lunches…this time courtesy of the Bellagio chefs and restaurants. It all started innocently enough, at Circo, where this creme de la creme of cooks gathered for a media luncheon featuring Massimiliano Campanari’s intense white truffles (the best we’ve had this season), Sean Griffin (Prime) and his grilling individual loin and rib-eye cap steaks for attendees, oysters with caviar (natch), lot’s of champagne (double natch), then a panoply of desserts from the Bellagio’s various dessert chefs, highlighted by various Philippe Angibeau (Le Cirque) creations. 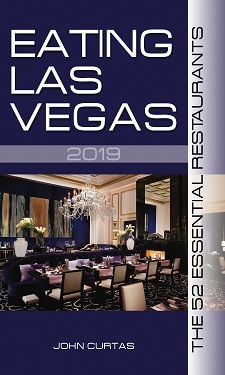 Glasses were raised, toasts made (especially a gracious one by Bellagio head chef honco Edmund Wong), and thanks given all around for what this grand dame has done for the Vegas dining scene. In other words, for the first three hours or so, it was just another day at the office for ELV. Some lame brain (with a voice that sounded eerily familiar) suggested we all go to Olives for mojitos. Lots of mojitos. Damn tasty, if memory serves, even if the exact memory of anything started to blur around this time. But since the suits were picking up the bill, we were off to the races. Then, those three hot blonds appeared, toasts were made to one of their pending disaste…er…uh…we mean weddings…and before you could say “I’ll have a Maker’s Mark Manhattan, up, with some extra bitters,” it was 5:00 pm and the bar at Prime beckoned. And you know what? Six hours of eating and drinking can make a fellow hungry. So after a few Prime toddies, it was time for a bite. One hot redhead showed up to talk some sense into us…and almost got us out of the hotel…when, who should we run into on the escalator but Julian Serrano! Now, if you know Serrano (0r chefs in general), you know he/they can’t let you go (especially if they’re standing outside their restaurant in their chef whites) without tempting you with a bite. “John, you just come een for a leetle bite,” Julian implored. Calvert Collins (our partner/hot blond in crime) protested (but not too strongly), The Food Gal® sighed, and before you could say: “Could you please have Picasso Master Sommelier Robert Smith dazzle us an assortment of red and white wines for us to blind taste (in our drunken stupor) during a four course tasting menu?” we were seated by the Bellagio fountains and doing just that. FYI: Blind tastings are humbling and a trap for even seasoned pros, but a ton of fun, if you can put your ego aside and be prepared to be wrong at least 75% of the time. ELV doesn’t recommend them for the easily intimidated, and really doesn’t recommend them to those who’ve been drinking cocktails for six hours. Still, even with this slight handicap, we nailed one — a Chateau Latour of recent vintage (if memory serves). Luck, you say? The equivalent of blind man hitting a home run off C.C. Sabathia? Perhaps, but we at ELV prefer to think of it as one more notch on our oenophile belt. From there it was on to multiple small courses of Picasso’s ethereal food. No one on earth does better with foie gras than Serrano, and his chefs have a way with seafood/langoustine risotto that challenges any Italian’s. It might be the best we’ve ever had. All of which sobered us up for the long, ten minute drive home. And that, food fans, is how you have a nine hour lunch! Stay tuned this Friday for another infamous feast…that we promise to report on. Holy Homicide Batman! Police Squad (In Color) is on YouTube! Dude, where on earth did you find the pic of the guy in bed with a baby horse? NICE!!! OMG, I’m so thrilled to finally be able to try Picasso this Friday! I guess we now have a better idea why it was included in ELV’s Top 10. Where were you when I was talking you up at Olives 2 weeks ago? Seriously!